….becomes other than the expected! It has been said many times. This is not the breed for everyone. Meeting the lovely creature, and their adoring (engaged) human on the beach, is not the same as bringing home the puppy. It means going from the approximately tiny ten-pound Weimar-pup to an adult-looking challenging pile of energy in about four-months. Sadly, too many folks don’t comprehend how the Weimaraner is wired, and they label them with all sort of untrue adjectives. For example, puppy biting is called aggression, or aggressive behavior. It is nothing of the sort; however, it has to be managed correctly. 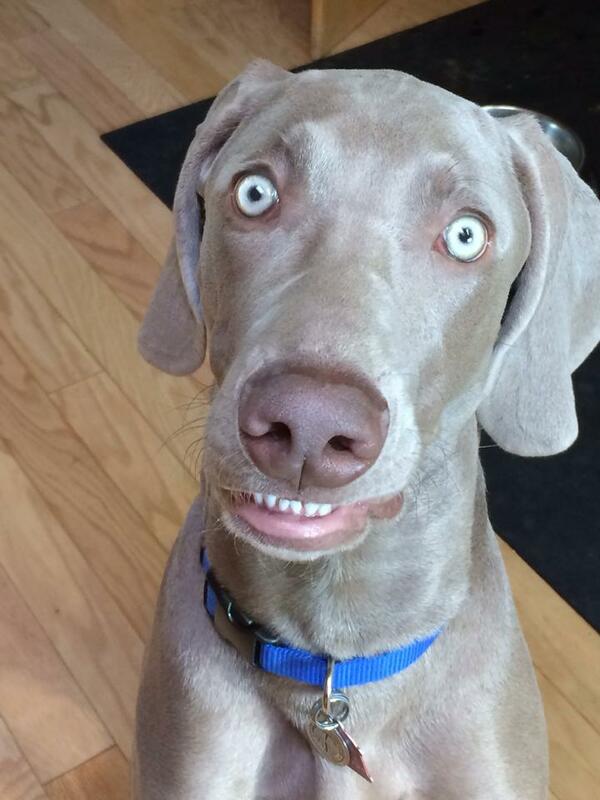 The Weimaraner loves their mouth, and using it can become a focal point. Within the litter, their litter-mates share bites equally. It is not mean; it is play-biting. The problem comes because we (humans) do not enjoy this; nor should we allow it to continue. We don’t bite them back. Their shark-like teeth leave marks. On children, and the aged this can be especially dangerous. You should never put your face into theirs–a bite can wreak havoc of a special sort on every imaginable level. 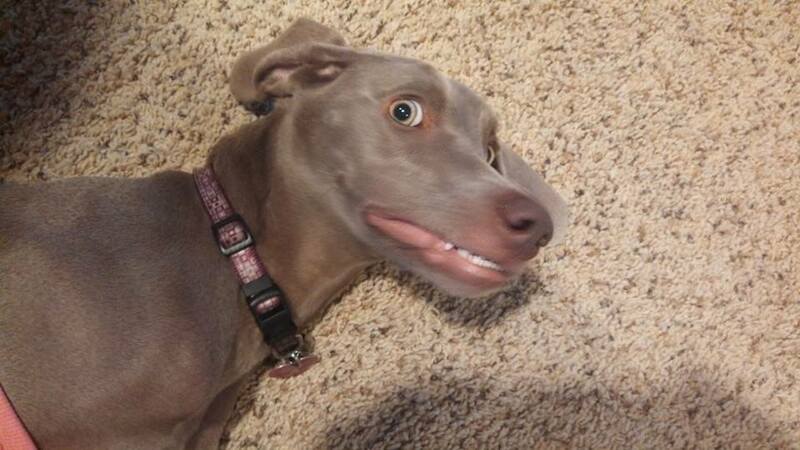 Puppy biting is the bane of nearly everyone who raises the Weimaraner. It is not the only challenge. They are concrete-thinking so allowing them freedom to roam the home can lead to accidents. It can become habitual in short order–the pup’s expected norm. We never recommend setting up an indoor potty area for this breed. The papers would be material to be shredded, and the area would become identified as the bathroom area of choice. This can resurface at the first sign of rain (even in year’s later). Accidents are best avoided; however, setting up the inside area identifies it as endorsed by you. There may be some who have had success using these methods, but across the board, this is not a good idea. Of course, there are other reasons for housebreaking problems. 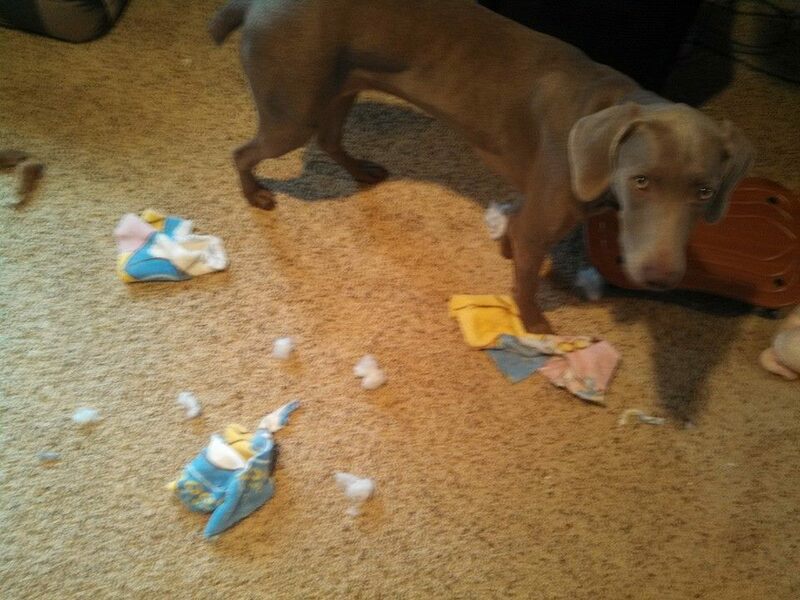 A re-homed Weimaraner can suddenly decide to potty inside; they need to be managed like the puppy–freedom is earned. The puppy-frenzy-fever leads to the desired outcome. Eventually, you embrace the roller-coaster-high experience of bringing the pup home. Their much-awaited arrival is marked by celebration that would rival the human family member’s debut. If your family includes current fur-family members, it would be wise to meet at a neutral location. Bring the new sibling home (with the current) rather than arriving with the surprise. Even when this meet-up goes as planned, lavishing the vast majority of attention on the brand new adorable family member is not the way to go. In fact, although it is hard to accomplish, being matter-of-fact, and not making such a huge fanfare over the pup’s every move can serve you, your current resident, and the protege well. Sure you can lavish praise, but tone it down a little. Keep the biggest fanfare (initially) for the current fur member’s achievements. Your heart will already be doing flip-flops. We realize it is hard to tone it down a bit. Stay even-keel, and reap the benefits. The only-child Weimar knows firsthand the universe surrounds them. They feed off this (center-of-the universe-scenario) in the worst possible way. They are prone to severe-separation anxiety. 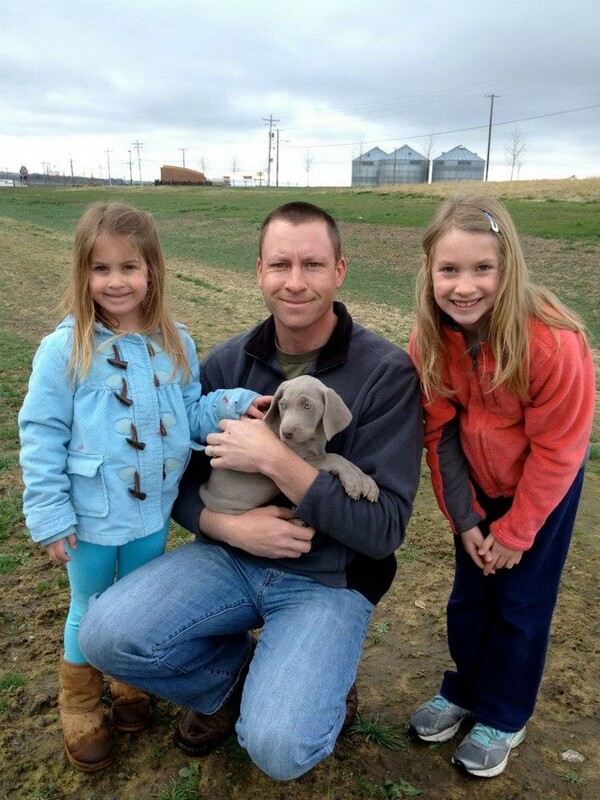 Families tend to align their every thought around acclimating the Weimaraner pup into the family. This seems to be the right approach; however, it can also feed the separation-anxiety factor. The puppy is smart, and when they first arrive, they might act a little off. In no more than three days, they will have their surroundings scoped out. They will be using their innate skills to plan a way to manipulate their situation to their liking. Folks that want to take off two-weeks from work, and to use it for the pup’s adjustment mean well. The problem comes when they leave to return to their normal life. This leaves their little charge in a tailspin. They feel abandoned, and their wounded heart doesn’t know what has happened. This can lead to all sort of unthinkable behavior–chewing everything, digging, barking, and destruction. These are problems anyhow; however, when they are fueled by absolute devastation over you abandoning them, it can become life-threatening. The best approach is to help them acclimate by introducing them to their normal life. If you are employed outside the home, you are going to need to have a Weimaraner puppy plan to cover the time you are away from the house. If you stay home all summer to spend time with them, subsequently you are somehow going to have to help them adjust to your impending schedule change. It is the kind thing to do. It is much easier than trying to undo untold damage to your home, your relationship, and your pocketbook. 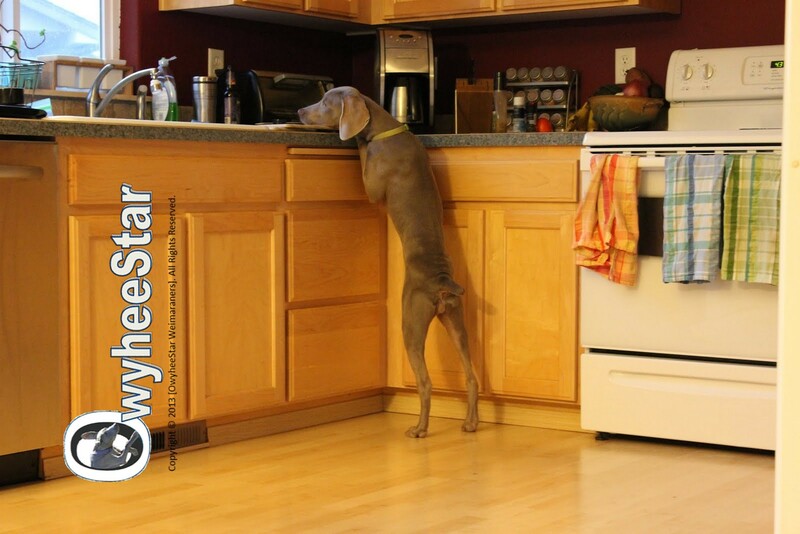 Mark our words, the Weimaraner can ingest things that are life-threatening, and emergency care is not cheap. Every prospective home sees their self as a good candidate. The puppy breeder is as well the gatekeeper for each pup they raise. In our way of thinking, it is their duty to screen potential homes, and to provide support. Unfortunately, no matter the effort there are going to be some pups that need a second-chance placement. There are many reasons this happens–some of these reasons are unthinkable. Tomorrow, we will look at these, and other reasons behind the placement failure. Nonetheless, keep in mind (and in your heart) that this breed doesn’t work for everyone. For some, there is nothing else that will do. Wrapping your thoughts around the two extremes can make the concepts discussed hard to understand. Dog-savvy persons want to believe they can deal with any breed, and there will be no problem. Sometimes this can end badly for everyone concerned. Our goal is to avoid the unthinkable! 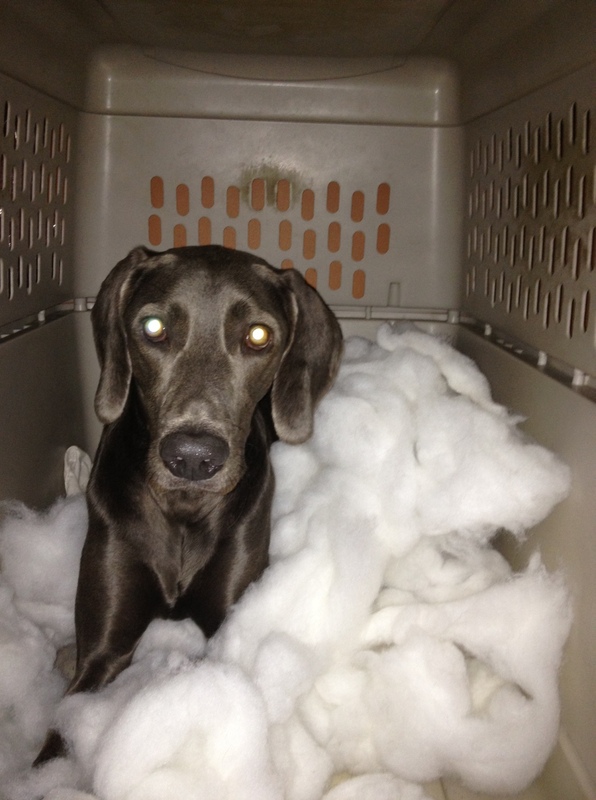 Posted on November 20, 2014, in Behavior & Training, Information and Education and tagged Concrete-thinking, Even keel, Puppy Biting, Separation Anxiety, Shark babies, Weim antics, weimaraner puppies, Weimaraner Puppy. Bookmark the permalink. 5 Comments. I believe you taught our Wilson the “sit” command since he already had it mastered when we met him. This one command has kept our boy out of so many dangerous situations. If he starts to get to nibbling on a visiting child I can quickly tell him to sit and he does it! If he thinks about bolting out of the car or out the open front door I can make him sit. It has been so helpful throughout his puppy hood. We can’t thank you enough for hard-wiring his little 8 week old brain with sit! You are the best.